NEW YORK, Dec. 13, 2017 – NBA G League games will stream live on Twitch, the world’s leading social video service and community for gamers with 15 million daily active users, beginning Dec. 15. This will represent the first time a major sports league has tapped into several technological innovations unique to Twitch. During the 2017-18 regular season, basketball fans can expect up to six NBA G League games to stream live on Twitch each week at twitch.tv/nbagleague. After each live broadcast, these games will be available on demand. The partnership expands NBA G League game distribution and aims to ambitiously innovate the digital presentation of basketball. In addition to the main broadcast, this partnership will feature co-streaming with select Twitch personalities and basketball fans. 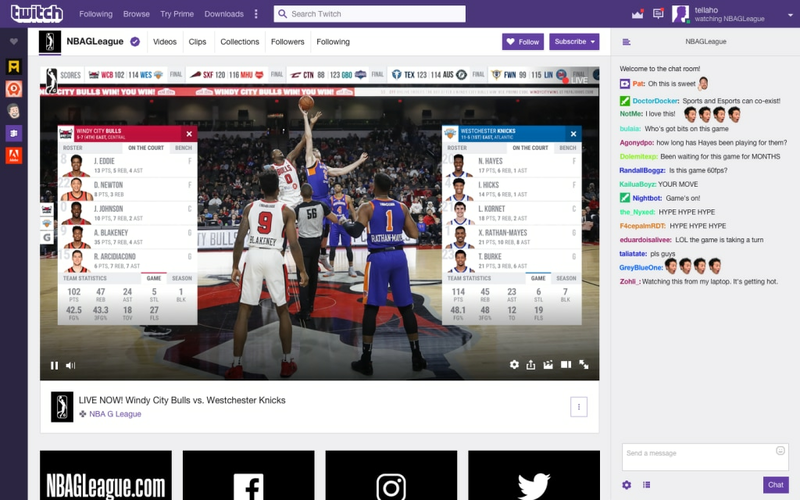 Co-streaming allows a creator to share another channel’s video feed, but with their own commentary and community, resulting in a more personalized, social experience that includes the ability for viewers to chat with commentators during the game. At launch, GoldGlove and more than a dozen other top personalities on Twitch will take part in the co-streaming initiative. Additionally, this partnership will introduce interactive functionality for Twitch viewers in the form of a channel overlay that provides easy access to a wide range of stats and the ability to accrue loyalty points. Stats: Viewers can click on a team’s name or logo next to the scoreboard to view player, team, game, and season stats. There will also be a ticker featuring league stats related to other games from around the league. Loyalty Display: Logged in viewers will be rewarded with loyalty points for passive and active behaviors and interactions with the stream. Viewers can compete to unlock achievements, climb season long leaderboards, and more to eventually earn prizes. As a research and development arm of the NBA, the NBA G League tests rules, technological innovations and equipment in an effort to elevate the game. This season, the league played with four-person referee crews during the month of November, while testing rules such as the innovative Coach’s Challenge and a two-minute overtime period. During the league’s 17-year history, it has experimented with the international goaltending rule, away-from-the-play fouls and in-game flopping penalties, among other rules.